This is a simulation of two objects attached to each other with a massless string. The string passes over a massless, frictionless pulley. Use the "Run" button to start the simulation, the "Pause" button to pause it, and the "Reset" button to reset the time back to zero. 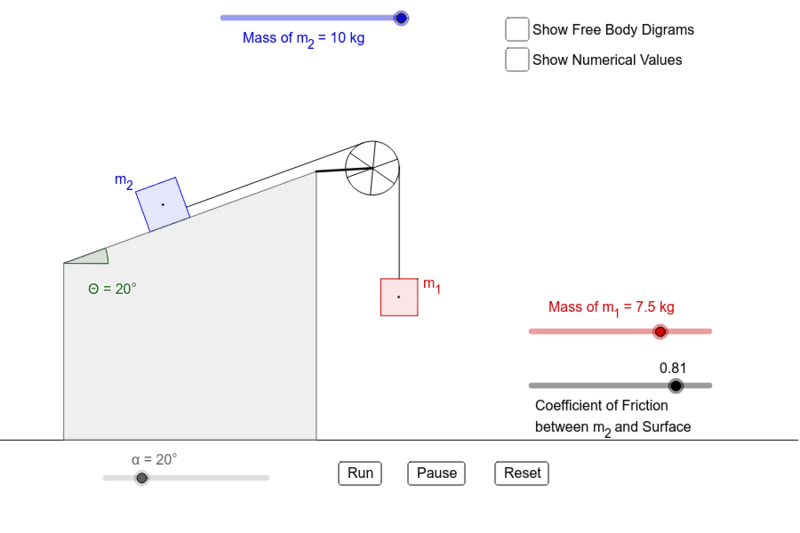 Use the sliders to adjust the masses of the two objects, the angle of the incline, and the coefficient of friction between mass m2 and the incline (in the simulation it is assumed that the static and kinetic friction coefficients have the same value). Use the checkboxes to show or hide the numerical values and the free body diagrams for the two objects.